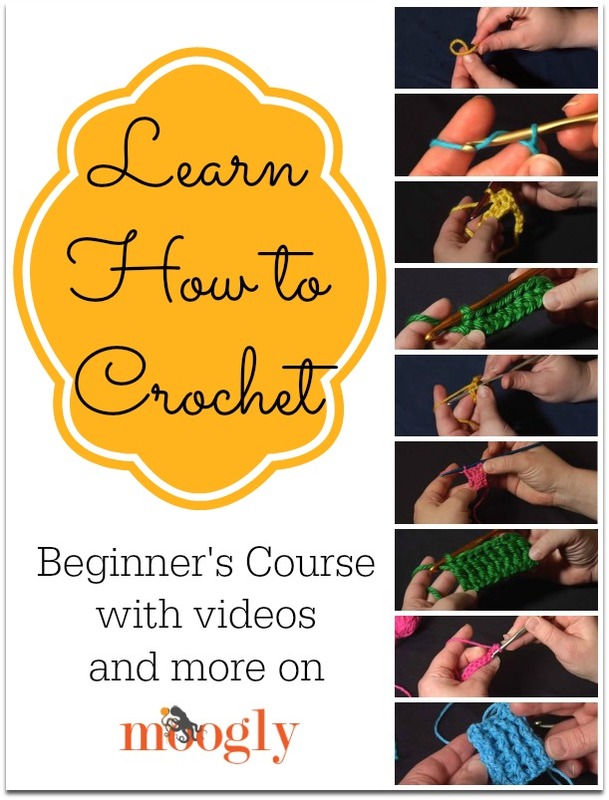 Learn How to #Crochet for Beginner's - with Moogly Videos! Odds are, if you follow Moogly, you already know how to crochet. But every so often I get an email or message asking me where a newbie can go to learn how to crochet, starting with the basics. While learning in person is great, not everyone has access to a class or crochet buddy. And books with their 2D drawings can be hard to follow if you don’t already know how to get started! So today I’ve done something about that! Below you’ll find several Moogly video tutorials, with short descriptions for each. I’ve put them in the same order I’d go in if I were there in person, teaching you how to crochet myself! These are some of the first videos I ever made – I was just a baby blogger! But the info is still good today! I’d recommend starting with a DK, worsted, or aran weight yarn (yarn symbol 3 or 4) in a light color. Then you’ll want a US-H 5.0 mm hook or US-I 5.5 mm hook. Go through the videos in this order, one at a time. And take some time to practice each! By the time you get to the end, you’ll be ready to tackle any crochet challenge, with the same patience and dedication. Let’s begin! The slip knot is how you’ll begin the majority of your yarny projects. True confession – I was late to the slip knot myself! For the first year I crocheted, I would tie a regular double knot loosely around my hook and just get started that way. The slip knot is adjustable, and an all around better choice, but if it’s tripping you up too much, just tie a knot and move on to chaining. More on Slip Knots here. Chaining is the most basic skill in crochet. And it still takes time to master! You’ll likely make hundreds of feet of chains before you gain the skills to always have truly consistent chains. This is where you’ll learn how it’s most comfortable for you to hold the yarn and hook as you work, and how to keep your tension consistent. And don’t make them too tight – you’ll need to get your hook back in there later! If you’re really itching to make your first project, you can make a really really long chain and loop it around multiple times for a bracelet or necklace – or use it as ribbon to tie up a pretty present! More on Chaining here. Single crochets are the foundation of all the stitches, and the first real stitch most people learn – with these you can work into that starting chain and start making actual crocheted fabric! Scarves, purses, blankets – all become possible with this stitch! Pay special attention in this video to how to get to the next row. And always count your stitches after each row – this is an important habit to get into, and will save you lots of time down the road, telling you right away if you’re accidentally adding or subtracting stitches somewhere. 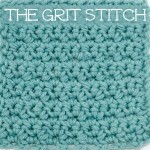 And you can do fun stitch patterns with it, like the Grit Stitch and Granite Stitch! More on Single Crochet here. In UK patterns, this is called a double crochet, and abbreviated “dc”. The slip stitch isn’t used much all by itself – though there are some designers trying to change that! But it is used a lot, and while you can make many flat patterns without slip stitching, you’ll need it eventually. And if you’ve mastered the single crochet above, this one will be a breeze! More on Slip Stitches here. The next step is the half double crochet. I’ve put them in height order here. You may have noticed that the single crochet is a short, squat stitch that typically makes dense, somewhat stiff fabric. The half double crochet gets us a bit more height and flexibility in the fabric, while maintaining most of the solidity that keeps it from being too see-through. It’s a lot like the single crochet, with just one extra step right at the beginning. More on Half Double Crochet here. In UK patterns, this is called the half treble, and is abbreviated “htr”. The double crochet is nearly as popular as the sc, if not more so! It’s got great height without being too “leggy” and it might just make you feel like you’re waving a magic wand! The fabric made with double crochets is perfect for blankets, scarves, hats, and other wearables – much softer than sc or hdc fabric, if a little more “holey.” And combined with sc stitches you can start with some great textures, such as the Griddle Stitch! 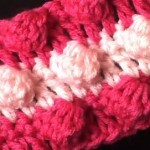 More on Double Crochet here. In UK patterns this is called the treble, and is abbreviated “tr”. This a stitch you won’t see as much as the others, but it does pop up in lacier items, as well as the corners of many afghan squares! It’s a simple extension of the double crochet – and because it’s so very tall, it gets you where you’re going fast! Two patterns that use treble crochet exclusively are here on Moogly – the Big Bold Chevron Afghan and Curtains! Get this one down, and there’s no stopping you – all the taller stitches are just one more yarn over (and then one more, and then one more…). More on Treble Crochet here. In UK patterns this is called the double treble, and is abbreviated “dtr”. Now all this time we’ve been working under both of those top loops when making stitches, and if the directions don’t mention it, then that’s the way to go! But you can get some very neat effects with the stitches you have already learned, by going under just one of the loops! Working in the back loop only on every row creates a ribbed effect, while working in the front loop only on every row creates a thinner, drapier fabric. Or you can alternate between them within the row for even more interest! More on FLO and BLO here. If you’ve gotten this far, you’ve got all the basics down. I’ve included post stitches here as a little taste of how you can really start taking what you’ve learned in new and exciting directions! Up until now, you’ve been working into previous rows via those two top loops – either one or both. But with post stitches you leave those loops behind, and stick your hook new and exciting places (hey now!!). Take a peek at post stitches here, and if it’s too intimidating, you can come back to them later – I know you can conquer them eventually. But as you can see, the possibilities are nearly endless! More on Post Stitches here. Thank you so much for reading and watching! Get Moogly on your favorite social media sites: Facebook, Twitter, G+, Pinterest and Tumblr, and sign up for the Newsletter so you don’t miss a thing! All photos and text copyright Tamara Kelly 2014. With the disclaimer that I have noooooo idea of the work involved to put it together: one of these days you should think about setting up a Craftsy class. If there was a particular pattern or technique or whatever that caught your fancy. I reckon you’d be a natural. 😀 Thanks so much Sarah! I’d love to, but alas, it hasn’t worked out just yet. I want to. Relearn. Can u or someone u now show me how to crochet again. The videos here are all free, and they’re some of the best on the Net. Start with the Slip Knot one, at the top of this page, and then work your way through them. If you’ve crocheted before, I’m sure that’s all you’ll need to get going again! Thank you so very much Sheila! Love your tutorials! My mom taught me to double crochet when I was little. But I didnt know what it was or what I was really doing. Your easy to follow videos have gotten me excited to crochet again. Thanks! This looks great! I love to crochet but never really learned how! I am left handed and nobody would try to teach me, till my gramma ( who had palsy ) sat me down and said she would show me! I crochet right handed. Never learned how to change colors so use multi colored yarn. I think it’s amazing you’re able to do it right handed! Great job putting the basics together! Great tips! Will post this on one my Crafty Pinterest boards. Best of the best to you! Thanks so much for doing this! It continually amazes me (in a good way!) how much people will do for others! And for the bloggers, others they don’t even know! Good to see all this love after what you here on the news. Thank you, and EVERYone for all that you do!!!! This is a GREAT idea. I love having a place I can refer newbies to to learn the basics. Might I also suggest that you include a video on how to hold the yarn and hook. Someone brand new probably could use help there too. 😀 Thank you so much Faye! Tamara Kelly thank you for being so kind and sharing these video/tutorials for all the folks that like myself know how to crochet but only know a simple stitch or maybe two as well as the folks that are new to the craft of crochet who see things that they want to make but don’t know how to do the stitch(es) that are needed for the pattern they like. I have run into that problem myself but now thanks to you I can expand what I can make and can use different stitches in things I might have used a sc stitch for before. I hope that you continue to do tutorials for some of the other stitches that are not in this set of tutorials because there are other stitches I have tried to learn but the tutorial I was watching wasn’t specific enough in explaining the how to part for making the particular stitch. It’s very sweet of you to share your knowledge with folks that you don’t know and have never met. 😀 Thank you so much Susan! I do have lots of other stitch tutorials on the Video Tutorials page, and I plan on adding lots more in the future! I learned to crochet in the 70s and have made MANY afghans. One for each member of my family. 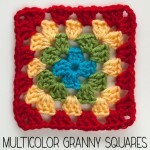 The prettiest one is the granny squares, each a different color, then bordered by black. A nurse I worked with on 3-11 shift taught me how. I have gotten many complements on my work. Thank you so much for sharing your knowledge and skills. You are a very good teacher/instructor. I have attended classes and watched videos; however, everything didn’t click together. Your short videos clicked. Please know that your generous sharing is really appreciated. 😀 Thank you so much!! I really appreciate you taking the time to say so, I’m so glad this helped! In a short amount of time I have learned so much from watching you work magic with yarn and a crochet hook. What a great teacher you are. THANK YOU, THANK YOU, THANK YOU! Thank you so very much Annalisa! 😀 I am so glad to hear it! I would really like to learn to crochet but I am left handed! When will that version become available? As soon as I can get my tech guy to get the videos all ready – sooner rather than later I hope!! Thank you SO MUCH for this website & the tutorials. I have always wanted to learn, but could never figure out how to get one loop off the hook without them both falling off. No-one ever tells you to turn the hook around, but watching you in this video now I just realised! And did 20 ch in no time at all. I am almost 50 years old with my third and fourth grand children on the way. I have tried to learn to crochet many times in the past but never got much past the chain stitch! Thank you so much for these video; they have been so helpful and I can follow along with the video. The babies are due in December and January. Thanks to your videos I feel confident that at the very least I will be able to crochet a blanket for each of them maybe even a sweater. I will refer this site to anyone who tells me they cannot learn to crochet! Hi Tamara! These are the nicest, clearest videos I’ve found on the web! You do things slowly enough that it’s easy to see what is happening, and your explanations are very clear. I always recommend them to my students in case they need help doing their “homework”! But I just noticed–on the video about the chain stitch, I think there’s a mistake in the subtitles. It says to look for the little Bs, rather than Vs. They don’t look much like Bs at all, so if it’s possible to change the text…. Although people seem to be learning just fine, so maybe it’s just me being picky! Hi Sheila! Thank you so much! The closed captioning is done on youtube’s end – they have some voice recognition do it, I think. I guess I need to enunciate my letters more carefully lol! Your videos accomplished what my crochet instructor couldn’t – teaching me the single crochet! Just curious – can you do a video on a quadruple crochet? Thanks so much for your videos!! I’m so glad you like them, thank you Carolyn! Tamara your videos are such a treasure. Your instructions are clear, your voice is delightful, and your kind and friendly attitude rings clearly throughout. Thank you! Keep on keeping on. Wow, thank you so much Ronnie! ♥ That makes my day! Hi! Thank you for taking the time to do these videos! I know how to crochet, but every so often, I will forget a how-to on a certain stitch. Also, I am teaching my niece and these videos will be great for her to review when I am not there to help her. Have a fantastic day! I’m so glad to hear they are a help! 😀 Thank you! And thank you for passing on the craft to another generation! O need help with everything. Can I help me. U or someone you know.